How to buy authentic Oscypek? Oscypek is traditional cheese from Polish mountains. It’s a smoked, very salty cheese made of sheep. The taste of the cheese is pretty strong, and not everybody will be fond of it, but I think that the cheese is something that you should try when you are in Podhale. 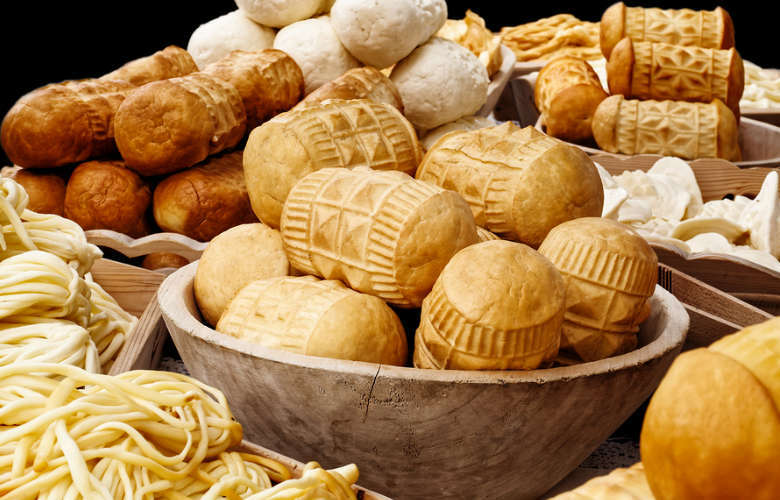 The authentic Oscypek can be found on the streets and also in the restaurants. There are few things you need to know about buying authentic Oscypek in Podhale or any other part of Poland. 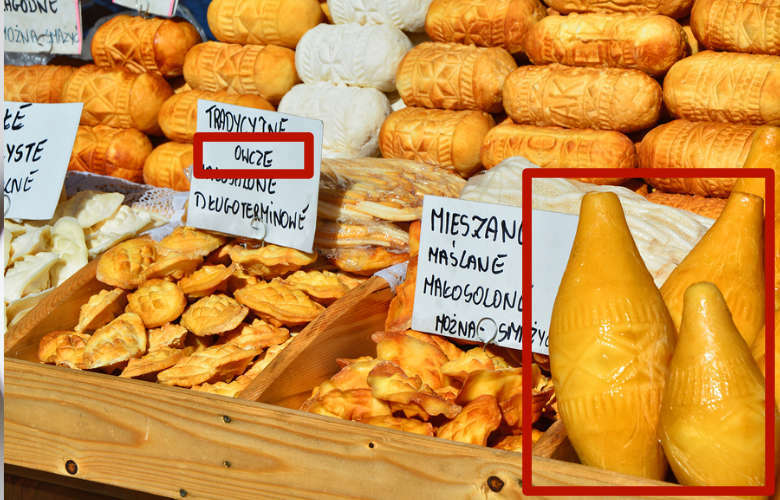 In polish shops and restaurants you can find cheeses that contain cow milk that look very similar to Oscypek, so you need to make sure you know, what you are buying. The other cheese which is similar to authentic Oscypek is called Golka. Usually, this cheese has a cylinder shape. They have a delicate taste and are not as salty as an original once. To make sure I would ask the person who is selling it to show a certificate because there are plenty of cheaters especially on Krupowki Street and next to Gubalowka Mountain. The safest way is actually to buy Oscypek in Bacowka (mountain shelter), there you will for sure find the real Oscypek. If somebody of you speaks polish here is a list of mountain shelters which sell the authentic Oscypek: Szlak Oscypkowy. You can also find a mobile phone application showing you the mountain shelters when you type Szlak Oscypkowy in an App Store, Google Play and for a Windows Phone. The app also works offline, which is excellent for tourists from other countries. I would still recommend you to try all of the cheeses made in Polish mountains. I am sure that this will be an unforgettable experience for you. Every year I spent a holiday with my family in the mountains and the only way to eat Oscypek back then was to eat it straight as it comes – no cooking involved. Although Oscypek has such a strong taste I liked it even when I was a kid. On our hiking trips, we always had one in a pocket! But few years have passed by since I was a kid, so things also changed for Oscypek. The last time when I was in the mountains, we went to several restaurants, and we have realized that Oscypek makes a great starter. My favorite way of eating it was straight from the pan with fried onions and cranberries on the side. I loved it so much that I have decided to prepare it for myself and my readers. If you are interested how to make pan-fried Oscypek please check out this recipe: Traditional Pan-fried Oscypek. The other delicious way of eating this cheese is to eat it with bacon! What a treat. After spending Easter 2018 in Poland, I have decided to add also this recipe to our blog: Traditional baked Oscypek with Bacon. It’s also very easy to make and mouthwatering! I am really glad, that the polish cuisine still developes and there are new dishes that are made using local products. Talking about local products – in Poland there is plenty of it them to try – so get your stomach ready for this culinary explosion! I am a Web Designer & Developer on a daily basis. Travelling and cooking sre my biggest hobbies and thats how I spend the most of my free time. Discovering new cultures and most of all - new eating culutres has been a lot of fun and I am always looking forward to cooking something traditional from every part of our planet. We spent 14 days in Poland at this time last year. Ate everything except duck, it was disappointing. But ate everything else in Polish cuisine including czardnina. So much want to come back and spend more time. Paternal grandparents from Malwa, Plock Diocese. Thank you! Hey Hank, thank you so much for your comment. I am glad you have enjoyed Poland and that our tips what to eat there where helpful. If you are going there again and have any questions, let me know. I love food as much as you do, or maybe more? ;) Take care! Enter your e-mail below and be the first one to hear about new videos, recipes, and posts! If it were only about us, then we would pack our bags and leave for a journey around the world. With this in mind, we have created this fantastic cooking blog; that has allowed us to use our passion for traveling and discovering different countries to create a part of the world that we would wish to visit, by sampling the various dishes that each country has to offer. © 2019 Cooking the World. All rights reserved.